Curtain climbers. Yard monkeys. Cherubs. Whippersnappers. Ankle biters. Urchins. I don’t know what you call them, but our children have been turned loose on the world. 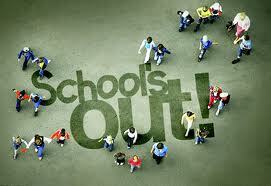 School is out for summer (at least it ends this week here where I live). By the end of summer I’m afraid my description of these little animals will be a bit stronger. I’ll be ready for them to return to the classroom. Still, I appreciate their euphoria. I can recall the butterflies that formed in my stomach as summer break approached each year: “No more pencils, no more books, no more teachers’ dirty looks.” It was sweet release. Now, this does not mean my summers were always easy. I worked on my uncle’s poultry farm every summer from the time I was twelve or so until graduation. And ironically, it was those hot, stinking chicken houses that convinced me to stay in school and get a college education. But as a kid anything – anything – was better than sitting in a dull classroom doing algebra problems, memorizing Lord Byron, and studying vocabulary words. Even if that meant doing hard labor shoveling, well, you know what. So, I still get giddy this time of year just thinking about escaping for the summer. But I’m not the only one – nor are my children. The real happiness is found in empty classrooms where teachers are dancing with unmitigated joy. At least I know my sons’ teachers are dancing. These dear souls will probably be sitting somewhere in a retirement home sixty years from now, telling horror stories about those McBrayer boys. Preachers’ kids are the worst, you know. I hope their teachers don’t tear up their contracts this summer and refuse to return. It’s been said that if teachers were paid like professional athletes, and if athletes were paid like teachers, our society would be a much better place. Amen to that. But money is not the reason these men and women give themselves to the classroom. Sure, teachers would take a raise (or two), but they teach for other reasons: They teach because they love working with children. They teach because they are drawn to a particular subject. Or they teach because as a student, they themselves were greatly influenced by a teacher. In fact, influence seems to be the real reason teachers teach. Why this higher standard? Because teachers have an extra responsibility, not only as adults that little ones observe, but also as ones who encode and train our children. Teachers are the architects and designers of the future. That is indeed, a great responsibility. Too many times we who stand behind pulpits or travel to the “mission field” (whatever that means) monopolize the market on doing God’s work. But everyone – everyone – has opportunity to do the work of God. This is doubly true for teachers. Theirs is nothing less than a divine calling. Sure, there are a few bad apples in the educational barrel – those who do not take their calling or responsibility seriously enough, or who give the profession a bad name – you can find these kinds of folks in all career fields. Yet, all in all, teachers are a heroic lot who deserve our support, admiration, and even our prayers. God knows if I were matched against twenty-five second graders every day, I’d want someone praying for me. And to my sons’ middle school teachers, a final word before you slip into the rapture of a kid-less summer: My wife and I have one more son coming your way. As he has been cultured by his older brothers, he may be the most challenging one yet. Regular readers of this column can confirm this for you. So accept my apology in advance. I’ll be praying for you.